LUSH, definition: very rich and providing great sensory pleasure. That's what I am attempting here. 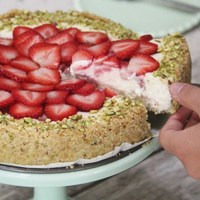 This recipe is best defined as a strawberry tart with a pistachio, graham crust. I was wanting to create something bright and refreshing to break out of the heavy eliquids that we often vape during the winter months. A creamy light custard with a graham cracker crust incrusted with pistachio undertones. CAP Vanilla Custard, TPA Cheesecake (Graham Crust), FA Pistacchio (Pistachio). Sweet, fresh strawberries with sugar added. I found it hard to use just one strawberry to get that fresh, ripe strawberry that I was going for, so I built my own using FA Juicy Strawberry, TPA Strawberry (ripe), and JF Strawberry Sweet. The pistachio is part of the body of this recipe but also lends itself to the accent note on the end of the vape. A 5 day steep is a minimum and I recommend 1 week.